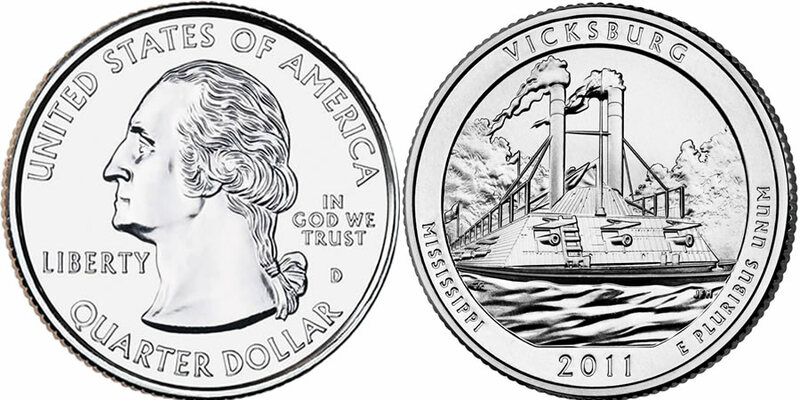 The 2011 Vicksburg National Military Park Quarter will be released by the US Mint in 2011 as the fourth strike of the year for the America the Beautiful Quarters® Program. 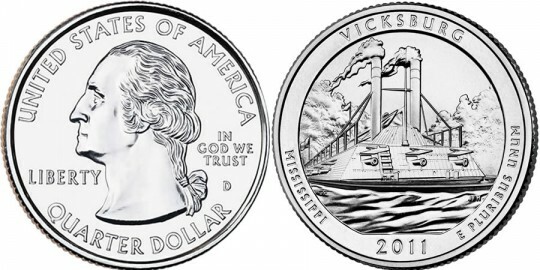 It honors Vicksburg National Military Park of Mississippi and is scheduled to be released by the US Mint in bags and rolls on August 29, 2011. Coins in this series honor selected sites of national interest from around the United States with a design on their reverse. A total of fifty six sites were chosen with the coins honoring them released at a rate of five per year from 2010 until 2021 when the last coin in the series is scheduled to be released. Vicksburg National Military Park was originally established on February 21, 1899 to commemorate the American Civil War Battle of Vicksburg and the greater Vicksburg Campaign which led up to it. The city was important to control during the War as it controlled the shipping on the nearby Mississippi River. Its surrender to Union Forces by the Confederacy is seen as one of the turning points of the war which was eventually won by the United States. George Washington is featured on the obverse of all of the America the Beautiful Quarters with a design originally completed by John Flanagan. It is surrounded by the inscriptions of "UNITED STATES OF AMERICA," "QUARTER DOLLAR," "LIBERTY", "IN GOD WE TRUST" and the mintmark. On the reverse, a depiction of the Civil War era gunboat USS Cairo is shown as it would have appeared steaming on the Yazoo River. The gunboat is currently on display at Vicksburg. The image is surrounded by the inscriptions of "VICKSBURG," "MISSISSIPPI," "2011" and "E PLURIBUS UNUM." It was designed by AIP Master Designer Thomas Cleveland and sculpted by United States Mint Sculptor-Engraver Joseph Menna.